Cleans tough stains ranging from coffee, ketchup, soy sauce, mustard sauce, olive oil etc. Can be used on a variety of surfaces like ceramic, marble, granite, mosaic etc. How to buy Amazon Brand - Presto! 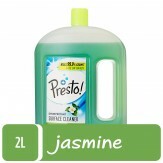 Disinfectant Floor Cleaner Jasmine, 2 L?